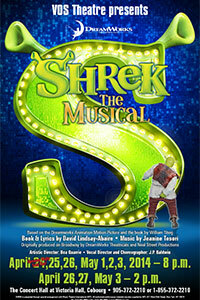 Shrek The Musical, based on the Oscar©-winning DreamWorks film that started it all, brings the hilarious story of everyone's favorite ogre to life on stage. In a faraway kingdom turned upside down, things get ugly when an unseemly ogre - not a handsome prince - shows up to rescue a feisty princess. Throw in a donkey who won't shut up, a villain with a SHORT temper, a cookie with an attitude and over a dozen other fairy tale misfits, and you've got the kind of mess that calls for a real hero. Luckily, there's one on hand and his name is Shrek. Ticket service fee extra - $2.50.